Look at that list of names. As we continue to creep closer and closer to our first pitch of the 2015 season, the numbers start to get more and more interesting. I mean, you’ve got a Boyer brother, which is neat. You’ve got a guy in Brunansky that I still remember the Cardinals dealing for, trading Tom Herr off to the team that just beat them in the World Series. You have Gilkey, who along with Ray Lankford was one of the few things worth watching in the early ’90s. You have Tatis, who was wearing 23 when he hit those two grand slams in one inning, a record that will never be broken. Then you have a couple of World Series heroes. We tend to forget about Reyes’s Game 1 shutdown of the Detroit Tigers in 2006, but the rookie was masterful, allowing just two runs in eight innings and outpitching Justin Verlander to give the Cardinals an early Series lead and prove that they were for real. Remember, that was the series that one columnist, half-seriously, suggested the Tigers would sweep….in three games. Having Reyes come in and just be outstanding on that stage was a huge thing and, while it raised expectations for him, expectations that he could never fill, it’s still a grand moment in Cardinal postseason history. That’ll do, my friend. That’ll do. Any of these would have been a worthy selection. However, I’m going with Simmons and I’m doing it for a strange reason. The reason is, I don’t really know much about him. Obviously, I know who Simmons was. I know he was the greatest catcher in Cardinal history before Yadier Molina arrived on the scene (with the possible exception of Tim McCarver). I know that he has the offensive chops to be a borderline candidate for Cooperstown. I know that he’s on the ballot for the Cardinal Hall of Fame again this year and should be a strong favorite to be inducted come August. However, for all those laurels, Simmons doesn’t seem to have the mythos or legend of a Lou Brock or a Bob Gibson. We don’t speak of him like we do Ozzie Smith or even Willie McGee. 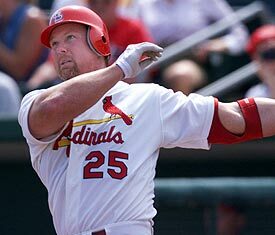 McGee and Jim Edmonds both outpolled him last year when the initial Cardinal HOF ballot was announced. For all his greatness, he seems to be overlooked in the rich history of the Redbirds. Timing is everything in baseball. One millisecond too quick and you pull a home run foul. A millisecond too late and you whiff on the pitch. It works that way in reputations as well. Simmons made his major league debut in 1968, while the Cardinals were on their way to their second straight World Series. He only got into two games, though, and was only technically a part of that winning crew. 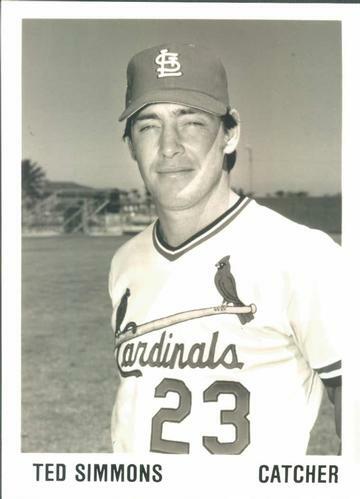 He left St. Louis in 1980, two years before Whitey Herzog‘s rabbits reached and won the World Series. He played in the desert, one of the dry periods of St. Louis history. There aren’t many of them, but Simmons was unlucky enough to be a part of some bad baseball teams and teams that never quite put it all together. Those kind of teams don’t capture the imagination like the teams of the ’60s and the ’80s, which means that he gets overlooked when we talk about true Cardinal greats. However, if a classy guy like Mark Tomasik will name his blog after Simmons’s nickname, that’s good enough for me and that’s good enough to make Simmons our selection for today.